Insurance companies always have been at the forefront of automating processes. Because they are at the source of a significant amount of traffic and correspondence with their customers that leads to repeatable processes: Claims management and Policy creation. In a first wave starting end of the 90′s a lot of insurances have successfully managed to move their paper based processes to automated workflow using advanced classification and recognition technologies. I remember well all the big projects that we have been doing and still do in this area. This already significantly reduces the time to process a single case and the manpower needed to do so. And insurances face a significant cost problem and increasing competition not only on their terms but also on their level of service. With process automation and digitization, using modern Classification technology, address and table extraction and semantic understanding the content of the documents becomes digitally available. In the current phase insurances are using this data and modern learning analytical methods to actually automate not only the process but also the decision making. If all information is available a KI system (like Skilja’s learning classifiers) can automatically decide if a claim is standard and can be paid right away or if it needs expert inspection. An application for a new contract can be clarified and checked mostly by semantic and analytical algorithms, that link it to the policy of the insurance – leaving the underwriter the task to finally check the suggestion based on the conclusion made by the machine. As the automation of physical and knowledge work advances, many jobs will be redefined rather than eliminated—at least in the short term. The bottom line is that 45 percent of work activities could be automated using already demonstrated technology. If the technologies that process and “understand” natural language were to reach the median level of human performance, an additional 13 percent of work activities in the US economy could be automated. The magnitude of automation potential reflects the speed with which advances in artificial intelligence and its variants, such as machine learning, are challenging our assumptions about what is automatable. It’s no longer the case that only routine, codifiable activities are candidates for automation and that activities requiring “tacit” knowledge or experience that is difficult to translate into task specifications are immune to automation. Being McKinsey they look specifically at the workforce, the FTEs (full time equivalents) needed for a task and the required skills in the future. 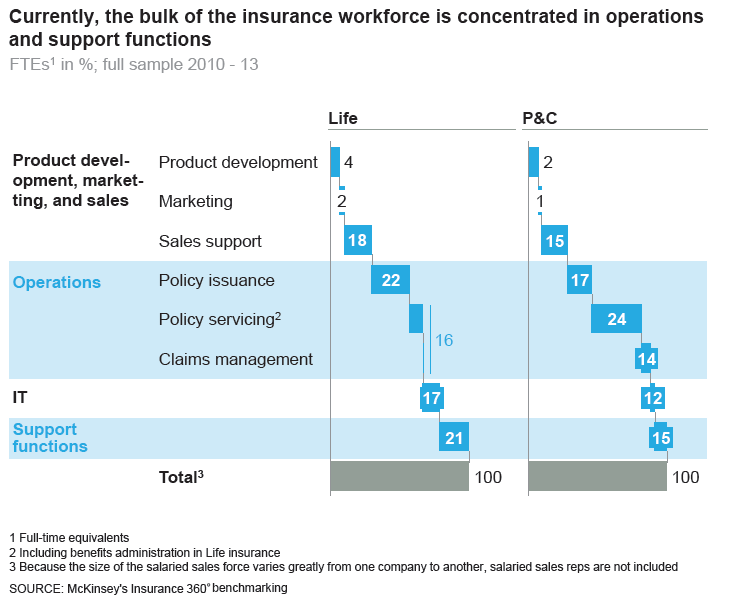 Using benchmarking across insurances McKinsey finds very interestingly that most time is spent in policy creation, policy servicing and claims management. Of course claims management is minor in Life but significant in P&C. The graph is interesting because Skilja is right now involved in several projects in Life where we exactly aim at reducing the time needed for underwriting a policy. And the reduction we see is significant using modern KI, deep learning and other algorithms. New technology and agile development methodologies allow swift process automation at limited cost. 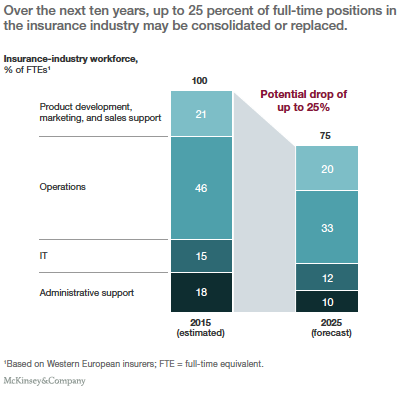 The effect in insurance workforce is dramatic as shown in the first graph above. Up to 25% of the FTE in these repeatable tasks will be consolidated. Meaning that the insurance can lower the cost, increase the number of customers served and reduce the time to process a claim or application. For more detailed information we recommend to read the excellent original article “Insurance on the threshold of digitization: Implications for the Life and P&C workforce” available for download here. If you are interested how this can be achieved from the technological side and what the current state of the art of classification, document understanding and automatic decision making is, please look here www.skilja.com or let us know info(at)skilja.com.